For nearly a decade, the British photographer — who bills herself as a documentarian of endangered “traditions and cultures” — has visited Zhang in her home in a small village in China annually, snapping portraits each time. As the years have passed, Farrell has met and photographed other such women, all in their eighties and nineties, their bodies visual reminders of a history not so far behind us. 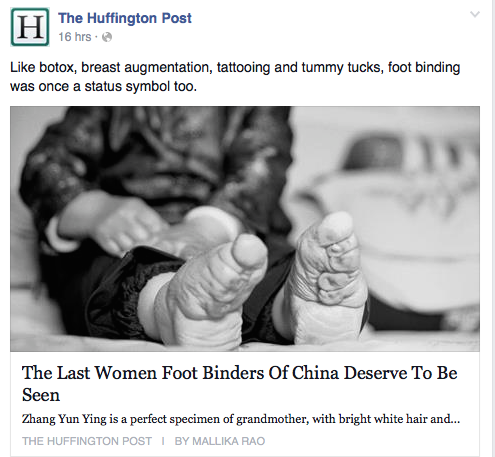 Foot binding (also known as ”Lotus feet”) is the custom of applying painfully tight binding to the feet of young girls to prevent further growth. The practice possibly originated among upper-class court dancers during the Five Dynasties and Ten Kingdoms period in Imperial China (10th or 11th century), but spread in the Song Dynasty and eventually became common among all but the lowest of classes. Foot binding became popular as a means of displaying status (women from wealthy families who did not need them to work could afford to have their feet bound) and was correspondingly adopted as a symbol of beauty in Chinese culture. The Manchu Emperor Kangxi tried to ban footbinding in 1664 but failed. In the 1800s (19th century), Chinese reformers challenged the practice but it was not until the early 20th century that foot binding began to die out, partly from changing social conditions and partly as a result of anti-foot binding campaigns. Foot-binding resulted in lifelong disabilities for most of its subjects, and some elderly Chinese women still survive today with disabilities related to their bound feet.